Cooktown is a small town and locality in the Shire of Cook, Queensland, Australia. Grassy Hill and Eliabeth Guzsely Gallery are good opportunities to explore the local culture. Visiting Fishing Charters & Tours and Great Northern Tours will get you outdoors. There's still lots to do: steep yourself in history at Cooktown History Centre, stroll the grounds of Cooktown War Memorial, enjoy the sand and surf at Finch Bay, and hike along Keating's Lagoon. For other places to visit, maps, and other tourist information, refer to the Cooktown trip itinerary planner . 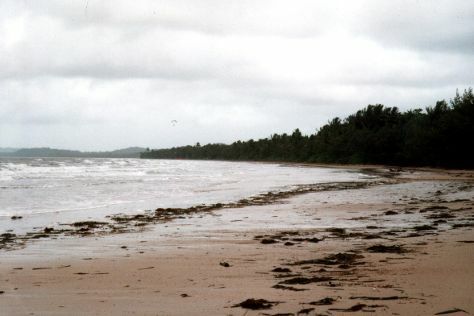 Bodo, Norway to Cooktown is an approximately 38-hour flight. The time zone difference moving from Central European Time to Australian Eastern Standard Time (Queensland) is 9 hours. Finish up your sightseeing early on the 18th (Thu) so you can travel to Cape Tribulation. Relax by the water at Thornton Beach and Myall Beach. Get in touch with nature at Daintree Discovery Centre and Daintree National Park. Step out of Cape Tribulation with an excursion to Floravilla Ice Cream Factory in Daintree--about 44 minutes away. 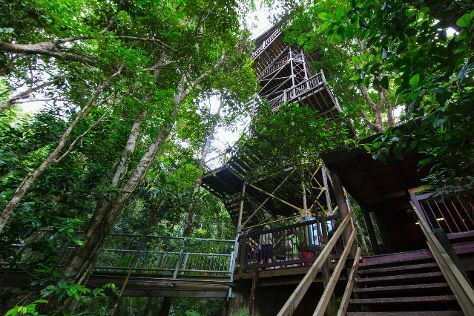 And it doesn't end there: delve into the lush surroundings at Daintree Rainforest - Cooper Creek Wilderness, take in the dramatic scenery at Alexandra Bay Waterfall, kick back and relax at Cape Tribulation Beach, and get a new perspective on nature at Daintree Entomological museum. To see maps, more things to do, photos, and more tourist information, go to the Cape Tribulation trip maker tool . You can drive from Cooktown to Cape Tribulation in 2.5 hours. In July, daily temperatures in Cape Tribulation can reach 30°C, while at night they dip to 20°C. Wrap up your sightseeing on the 22nd (Mon) to allow time to travel to Port Douglas. Head to Sunday Market Port Douglas and Des Spencer Galleriesfor plenty of shopping. Do some cultural sightseeing at Ngarru Gallery and Studio 49 Artisan Gallery. Spend the 26th (Fri) spotting exotic species with a safari tour. Spend the 29th (Mon) exploring nature at Mowbray National Park. There's much more to do: get to know the resident critters at Wildlife Habitat Port Douglas, head outdoors with The Bump Track, explore the gorgeous colors at Opal Reef, and look for gifts at With Sugar. For maps, traveler tips, ratings, and more tourist information, go to the Port Douglas trip itinerary maker . Getting from Cape Tribulation to Port Douglas by combination of car and ferry takes about 2 hours. Other options: take a bus. July in Port Douglas sees daily highs of 30°C and lows of 20°C at night. Cap off your sightseeing on the 30th (Tue) early enough to go by car to Cairns. For shopping fun, head to Village Gallery or Michael Seebeck Gallery. Visit St Monica's Cathedral and McLeod Street Pioneer Cemetery for their historical value. Venture out of the city with trips to Palm Cove (Palm Cove Beach & Kayaking & Canoeing) and Australian Butterfly Sanctuary (in Kuranda). Spend the 2nd (Fri) wandering through the wild on a nature and wildlife tour. Spend the 31st (Wed) among aquatic life with a scuba or snorkeling tour. The adventure continues: trek along Esplanade Boardwalk, soar above the sights with a balloon tour, enjoy some diversion at Esplanade Lagoon Pool, and hunt for treasures at Rusty's Market. To find traveler tips, ratings, where to stay, and other tourist information, use the Cairns day trip app . Traveling by car from Port Douglas to Cairns takes 1.5 hours. Alternatively, you can take a bus; or take a shuttle. In July, daily temperatures in Cairns can reach 30°C, while at night they dip to 20°C. Finish your sightseeing early on the 8th (Thu) to allow enough time to drive to Mission Beach. Visit Mission Beach and Etty Bay for some beach relaxation. Get outdoors at Fishing Charters & Tours and Skydiving. You'll find plenty of places to visit near Mission Beach: Innisfail (Mamu Tropical Skywalk & Innisfail Temple). The adventure continues: explore the galleries of Helen Wiltshire Gallery, take in panoramic vistas at Golden Gumboot, and hike along Kennedy Walking Track. To see more things to do, photos, and tourist information, read Mission Beach online route planner . Getting from Cairns to Mission Beach by car takes about 2 hours. Other options: take a bus. Finish your sightseeing early on the 11th (Sun) to allow enough time to travel to Herberton. Herberton is a town and locality on the Atherton Tableland in Far North Queensland, Australia. Start off your visit on the 12th (Mon): contemplate the long history of Historic Village Herberton, view the masterpieces at Rainforest Gems Gallery & Studio, then play a few rounds at Mareeba Golf Club, and finally view the masterpieces at Tolga Woodworks Gallery & Cafe. To see more things to do, reviews, traveler tips, and other tourist information, use the Herberton attractions app . Getting from Mission Beach to Herberton by car takes about 2 hours. August in Herberton sees daily highs of 31°C and lows of 19°C at night. On the 13th (Tue), wrap the sightseeing up by early afternoon so you can travel back home.